This month’s First Monday Library Chat features the Arthur and Elizabeth Schlesinger Library on the History of Women in America at the Radcliffe Institute for Advanced Study, Harvard University. We spoke with Marylène Altieri, Curator of Books and Printed Materials, about the Schlesinger collections. She was joined by Barbara Ketcham Wheaton, an independent scholar and culinary historian who became an affiliate of the library in the 1970s and who has welcomed legions of budding scholars to Schlesinger as a de facto research advisor. The Schlesinger is known for its commitment to collecting materials on the history of women in America, including the historic ties between women, food, and etiquette. Can you tell us about the range and scope of culinary materials held at your institution? When did the Schlesinger begin collecting materials on these topics? Schlesinger Library, the world’s most significant collection of books, manuscripts, periodicals, images, and artifacts documenting the history of women in America, is also home to one of the country’s most extensive and distinguished culinary collections. The Schlesinger’s culinary collecting goes back to 1960, when 1500 historic cookbooks, many donated to Harvard College by Marietta Greenough, were transferred to the library, then known as the Women’s Archive, from Widener Library in Harvard Yard. Building on that kernel, the culinary collection grew to encompass not only books but periodicals, papers of culinary figures, and ephemera such as pamphlets and menus. Barbara Haber was the Curator of Books at Schlesinger for over three decades at a time when few academic libraries had any interest in this area, and through her advocacy the culinary collection became firmly established here and continued to grow. The culinary collection grew mainly by gifts and continues to benefit from them, combined with strategic purchases of essential new publications and antiquarian purchasing to fill gaps and deepen our strengths. Our collection policy, reflecting the reality that now many libraries collect in this area, defines our focus on cookbooks that emphasize the domestic aspects of food and its role in the lives of women and families. We estimate that the culinary collection now includes 20,000 volumes, going back to 1567 and including thousands of rarities from America and Europe. Our main strength in the printed collections is American culinary history. Other strengths include cooking as part of domestic science (which crosses over into our women’s history collections); a large collection of periodicals, both culinary and general women’s publications; French and Continental cookery from the 16th to 21st centuries; significant collections of Russian and Eastern European cookbooks; Swedish cookbooks; modern Greek cookbooks; works on vegetarianism and other health diets; 20th-century British cookery; wartime cookery; culinary ephemera including over 4500 pamphlets, and menus, films, and even blogs. We also have significant holdings in domestic arts and kitchen design; a recent Museum of Modern Art show on the History of the Kitchen featured quotations from the works of Christine Frederick, a domestic scientist whose papers we hold. Etiquette and consumer advocacy are two further related areas; we hold historian Arthur M. Schlesinger’s collection of 19th and early 20th century etiquette books, which includes many works on dining etiquette, and many works on consumer aspects of food and cooking. And of course, the related collection here of 80,000 volumes of books on women’s history contain a vast amount of material on women’s activities in the home, including cooking. In addition to the print collections, we have many outstanding and important culinary collections among our 3,500 manuscript collections. Here you will find the papers of many women and organizations of the culinary world: Julia Child, M. F.K. Fisher, Elizabeth David, Simone Beck, Dione Lucas, the Rombauer-Becker Family, Grace Zia Chu, Stella Standard, Peg Bracken, Roberta Kalechovsky (a Jewish animal rights and vegetarian writer/activist), and Zarela Martinez; The Window Shop café founded by wartime Eastern European immigrants on Brattle Street in Cambridge, the Corner Book Store, a renowned culinary book shop operated by Eleanor Loewenstein in New York City, papers of Christine Frederick and Esther Peterson, home economists; several home economics associations; culinary organizations such as Les Dames D’Escoffier, the Epicurean Club of Boston, oral history interviews with members of the International Association of Culinary Professionals, Records of the Women and Food Information Network, Records of the Fishermen’s Wives of Gloucester, and many handwritten, or manuscript, cookbooks. What distinguishes Schlesinger from other culinary collections is that our culinary collections are embedded in a rich and deep context of materials documenting women’s lives and domestic and family life. There isn’t another collection that can offer such a supportive context; this context greatly enhances the research experience and the possibilities here. Another distinction is that we are open to the public; no academic affiliation or prior vetting process is required to use our materials. 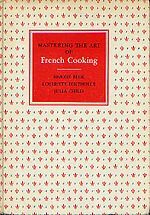 Two of the most well-known collections at the Schlesinger are those of Julia Child and her fellow author Simone Beck, with whom she wrote Mastering the Art of French Cooking I and II. What’s the history behind the Child and Beck papers, and how did they come to be a part of the Schlesinger Library? It was through Avis DeVoto that Julia Child’s papers first came to the Library. 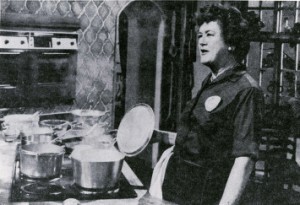 Mrs. DeVoto, a cookbook editor at Knopf, had corresponded extensively with Julia during the 1950s and 1960s, during the time Julia Child and her collaborators were laboring on the manuscript of Mastering the Art of French Cooking, and she and her husband became good friends of Julia and Paul Child. When Mrs. DeVoto, who knew the collecting interests of Schlesinger Library very well, decided to give the letters she received from Julia and Paul Child to the library, the Childs also donated their letters from Avis DeVoto. This gift, heralded in the Library’s annual report for 1968-70 as “an especial pleasure,” opened the door. Nearly every year from that point on, the annual reports record donations of books from Julia Child, eventually numbering in the thousands. Julia Child had built an impressive collection of rare and important cookbooks during her residency in France, in her zeal to master French cooking techniques and to research the historic antecedents for every recipe she wrote. In 1976, she signed the agreement that formalized the donation of her papers, and she began to deposit her papers as well as books here steadily. The final chapter in the Schlesinger’s acquisition of Julia Child’s papers was written in the fall of 2001, when Child moved to California. This last donation comprised 94 cartons; included were Julia Child’s detailed subject files (covering everything from Artichokes to Zucchini), carefully organized over the years by her office staff. There were also thousands of photographs, mostly taken by her husband Paul; files on her television programs, correspondence, records of dealings with her publishers, framed awards, and Paul Child’s diaries of their travels. One can imagine many uses of these papers in the future, from studies of early television history to the conditions of social life in France, Germany, Scandinavia, and other countries in the 1950s and 1960s. In 1992 Julia Child donated a significant collection of papers of her longtime professional colleague and close friend Simone Beck to Schlesinger Library. Simone Beck, Julia Child, and Louisette Bertholle founded the Ecole des Trois Gourmandes in Paris, and they also wrote the first volume of Mastering the Art of French Cooking in 1961; Child and Beck then went on to bring out volume two in 1970. Child and Beck remained extremely close until Beck’s death in 1991. It is said that many of the recipes in Mastering were Simone Beck’s recipes, researched, greatly enhanced, and carefully explicated for American cooks by Julia Child. In light of this, it’s particularly interesting to see Beck’s own early handwritten recipe collections, included with her papers. Schlesinger recently acquired further materials that will enhance scholars’ understanding of Beck’s own cookbook writing and how Child encouraged and influenced her friend. The new material consists of 80 letters, as well as typescript drafts and recipes, and a photograph of Beck. Julia’s papers radiate with her serious and thorough approach to everything she did. Her papers are important because she believed deeply that what she was doing was important, not for her own glory, but in service of her goal: raising the standard of cooking and eating and making it attainable and fun for everyone. In addition, her papers trace her astounding personal evolution and her invention of new career paths for women. Most people associate Child with her books or with her very popular cooking shows (“The French Chef,” “Julia Child & Company,” and “Dinner at Julia’s,” among others) but she was also devoted to scholarly study of gastronomy. Can you tell us a bit about her efforts to introduce this as a serious field for academic work? Julia Child was a diligent student of culinary history and acquired a substantial research library of historic cookbooks during her residency in Europe in order to study the history and variations of the recipes she was developing. Julia Child’s books comprise one of the largest collections of European, particularly French, cookbooks in America; when still housed in Child’s own home, she generously opened her door to researchers who could not find these books in American libraries at the time – Barbara Ketcham Wheaton was given a key to the house and encouraged to use Child’s books as needed. Before she died, Childs donated nearly 5,000 titles to Schlesinger. There are many treasures among them: her beautiful 18th and 19th century editions of Menon, La Chapelle, La Varenne, Carême, Grimod de la Reynière, and Urbain Dubois; her two 19th-century editions of The Frugal Housewife, by Lydia Maria Child; a wonderful late 19th-century work on using leftovers (L’art d’accommoder les restes, dédié aux petites fortunes), her 1931 first edition of The Joy of Cooking, her Santa Barbara Junior League Cookbook of 1939, her Fannie Farmer, her Larousse Gastronomique boldly inscribed “La Pitchoune”, the little Norwegian cookbook issued by her cooking instructor in Norway, Lolly Raestad, and the work on Chinese Snacks translated from the Chinese by Nina Simonds, who wrote an entire letter to her mentor Julia inside the front cover. Julia Child’s book collection has been cataloged in detail, is used by many researchers, promoted extensively in our public outreach and exhibits, and stored in the best possible climate-controlled and secure storage. I know that the Schlesinger’s culinary collections have inspired both exhibits and seminars (most notably those organized by Barbara Ketcham Wheaton), and the public’s response to those efforts at outreach has been terrific. Can you tell us a bit about the ways that members of the public are invited to engage with your culinary collections? Cookbooks, unlike novels, often change from one edition to another. The reasons for these changes include new ingredients, new equipment, changing tastes and perceptions of health benefits. The library has an especially notable sequence of Menon’s Cuisinière bourgeoise, from its first edition in 1746 until well into the 19th century. It was published in many parts of France, even during the Revolution; it was translated into most European languages, English, and Russian. The Schlesinger Library’s collection documents some of these changes in its more than four dozen editions. These books are full of information but much of it comes in very small units, making comparisons among the editions a challenge. To gain control over the details I have evolved a method for analyzing the contents of cookbooks in a structured way, and for more than a decade I have been offering a week-long seminar at the Schlesinger Library on these topics. A close reading of a dozen or more cookbooks looking only at ingredients reveals much about nutritional, sensory, seasonal, and class differences. On the second day a fresh group of books is read, and only the kitchen, its equipment, cooking techniques, and the management of heat and cold are considered. On the third day each person chooses a menu and mentally recreates the work-flow that produces the meal, and the means by which it is presented and eaten. Next we look at the cookbook as a genre, its structure and language, and the audience it addresses. Recipes are ideas, and like other ideas they move freely across boundaries of language, space, and class. They populate the cookbook-structure, but are not confined to it. At the end of the seminar we ask what place these books played in the lives of the writer, the publisher, the reader, and the cook. Clearly there is something in this material that calls out to people. I get many offers from families who have a precious mother’s or grandmother’s recipe book that they’d like to donate. For them, these items have deep sentimental value; but more and more people are recognizing that they have research value as well. They are not unlike family photo albums. For many adults, the mere sight of the faded spine of their mother’s Settlement Cookbook or Joy of Cooking or the cracked plastic spines of those charitable cookbooks is enough to reduce them to tears. Our collections are fully cataloged in our online catalog, HOLLIS, which is available worldwide on the Internet. Many thousands of our photographs are digitized and also available for viewing on the Internet. A substantial number of our books are also digitized. For scholars who wish to come to the library in person, we offer small research grants for undergraduates, advanced degree candidates, and postgraduate researchers as well as independent investigators (see www.radcliffe.harvard.edu/schlesinger-library/grants). All materials must be used in our supervised Reading Room, but no academic credential is necessary. Researchers simply register at our front desk to use the collections. Our Research Services staff can correspond with researchers at length about their needs and advise them in detail on the contents of our collections. They can be contacted at slref@radcliffe.harvard.edu. 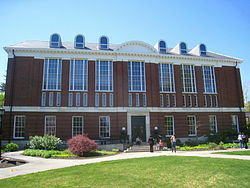 The online catalog can be consulted at www.hollis.harvard.edu. Detailed information about visiting Schlesinger Library and about all our collections is available on our website, www.radcliffe.harvard.edu/schlesinger-library. The researchers who come to the Schlesinger are able to read, and touch, the cookbooks and papers of women they’ve never met and to piece together the quality of their lives, the structure of their society, and the nature of their discourse from the simple texts of their daily domestic work.